Jesus took with him Peter and James and John and led them up a high mountain where they could be alone by themselves. There in their presence he was transfigured: his clothes became dazzlingly white, whiter than any earthly bleacher could make them. Elijah appeared to them with Moses; and they were talking with Jesus. Then Peter spoke to Jesus. ‘Rabbi’, he said it is wonderful for us to be here; so let us make three tents, one for you, one for Moses and one for Elijah.’ He did not know what to say; they were so frightened. And a cloud came, covering them in shadow; and there came a voice from the cloud, ‘This is my Son, the Beloved. Listen to him.’ Then suddenly, when they looked round, they saw no one with them any more but only Jesus. As they came down the mountain he warned them to tell no one what they had seen, until after the Son of Man had risen from the dead. They observed the warning faithfully, though among themselves they discussed what ‘rising from the dead’ could mean. 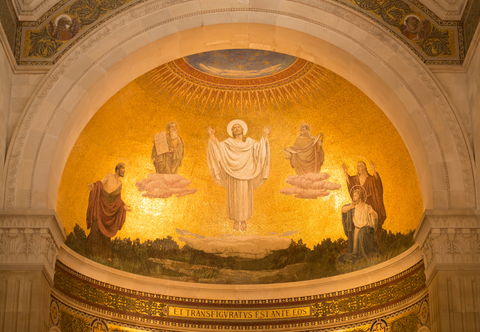 Jesus heard at the Transfiguration that he was beloved! We all want to know that someone would say they love us. beloved on the earth. R Carver. We are all the time God’s favoured ones – it’s ourselves that miss out on it. We live in the big wide world of God’s love, and Jesus on Tabor was allowing himself be loved in the radiant light of God, shining even in the cloud. Together we are loved…together on this mountain. Light is caught from one to the other. We are the light of Tabor mountain for each other. All are loved. The one I like and don’t like! The radiant body of Christ was hammered and killed later by ourselves. Love killed at Calvary rose again. Love cannot die. We can transfigure or disfigure each other. We can bring out the light and the hope and the joy in our belonging to God! We can transfigure a school, a parish, a community any group by first of all our being loved by God and letting love go out. If we really believe we are loved by God then the world we live in is transfigured, changed. In the light of the cross, the sign of our faith, the way we are saved. Light of God, love me, save me, call me. This entry was posted in Gospel of Mark, Gospel Reflection, Liturgy Resources, Prayer Resources, Scripture, Year B and tagged Beloved, Donal Neary SJ, Gospel Reflection, Gospel Reflection for 1st March 2015, Jesus, March 1st 2015, Mark 9:2-10, Scripture and Reflection for 2nd Sunday Lent Year B, Son of Man, Tabor, Transfiguration.